Join Alastair Greener in the Telegraph Studios as he interviews Encompass Co-Founders Wayne Johnson and Roger Carson as part of the Data Analytics campaign. Join Alastair Greener in the Telegraph Studios as he interviews Encompass Co-Founders Wayne Johnson and Roger Carson as part of the The Business Reporter Studio debates – Data Analytics campaign. Getting Know Your Customer (KYC) compliance right is not optional. Failing to comply with regulations attracts punitive enforcement actions, damages reputations and can ultimately reduce returns to shareholders. Compliance professionals must assess every prospective customer for risks against Anti-Money Laundering (AML) and Counter Terrorism Funding (CTF) Regulations. Defining KYC policies to prescribe what information must be collected and analysed proves to themselves and to regulators that they have undertaken due diligence. At their heart, KYC policies are data-driven workflows composed of a sequence of information gathering steps used to build a picture of a client: what is the client’s business activity? In which jurisdiction is the client based? Who are the company directors? Who is the ultimate beneficial owner? In theory, this sounds simple. In practice KYC compliance consumes hours and days of analysts’ time, is error-prone and is subject to subversion when analysts substitute unapproved sources of information for those prescribed in policy. A recent industry survey revealed financial firms’ average costs to meet their AML obligations are $60 million, some are spending up to $500 million on compliance with KYC and Customer Due Diligence. Clients are left frustrated by lengthy on-boarding processes, operational costs spiral, and compliance officers are forced to undertake expensive audits. An opportunity exists to bring the power of process automation to solve KYC compliance. Encompass products work with the information providers that your organisation already trusts and uses today. Encompass routinely executes policies ensuring every question central to your due diligence is answered in real-time. KYC checks are completed in seconds and minutes, accelerating on-boarding to ensure each client relationship proceeds on the best possible terms. Your existing compliance team immediately becomes far more productive freeing them to apply their experience and expertise at scale as your business grows. The results of every KYC check are transparent and secure, always available for review and audit by compliance officers and regulators. As Software as a Service delivered from the could, Encompass’ benefits are immediate for your organisation. 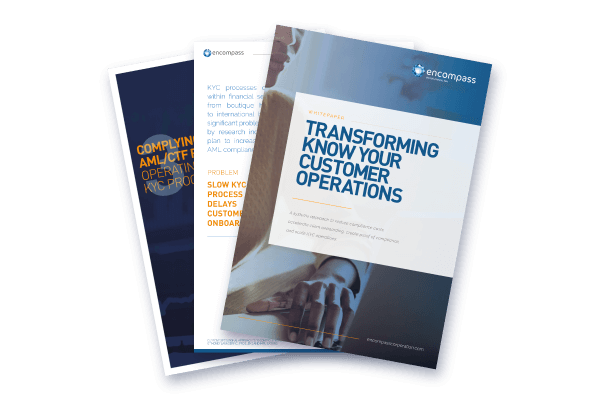 Encompass: Transforming KYC compliance for lawyers, accountants and financial institutions.